The Breteuil table or the Table of Teschen? These two names immediately evoke 18th century European history. 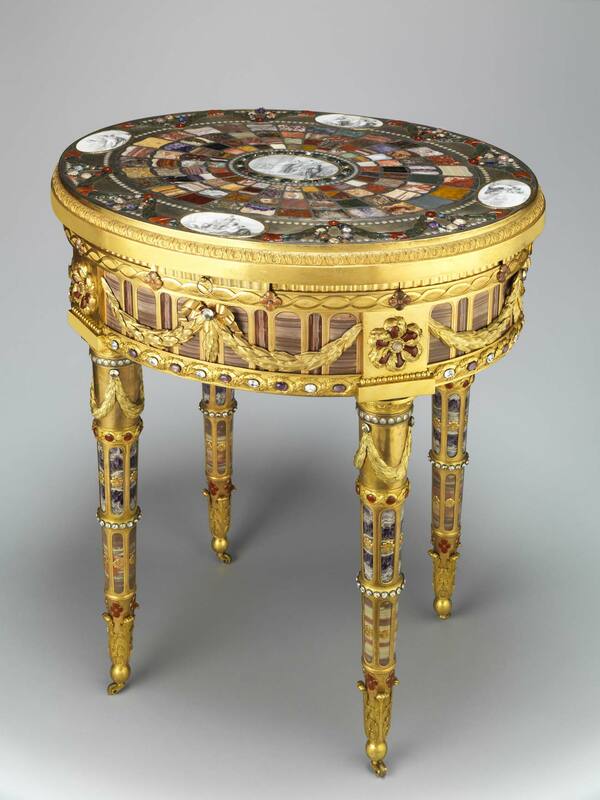 Crafted in 1779 by Johann Christian Neuber, a German goldsmith renowned throughout Europe, the Table of Teschen, also known as the Breteuil Table, was gifted to the Baron de Breteuil in 1780 to thank him for the role he played in the Treaty of Teschen. A history refresher: Louis Charles Auguste Le Tonnelier, Baron de Breteuil, was the King Louis XVI’s ambassador in Vienna, Austria. Following the death of Maximilian III of Bavaria in December 1777, who had left no heir, Prussia and Austria engaged in a battle – the War of Bavarian Succession – over the control of the Duchy of Bavaria. When Russia threatened to enter the conflict as a Prussian ally, the two warring powers began the negotiations that led to the Treaty of Teschen. Signed in May 1779 under the aegis of the Baron of Breteuil, the treaty mainly served Prussian interests and only gave Austria a small Bavarian region, Innviertel. The Table of Teschen was offered to the Baron de Breteuil by Frederick Augustus III, then the Elector of Saxony and later its first King, to thank him for his skilful diplomatic role in safeguarding Saxony’s interests and in sealing the peace treaty. This Table is no mere piece of furniture: it is a unique work of goldsmithing, made of gilded bronze over a wood core. 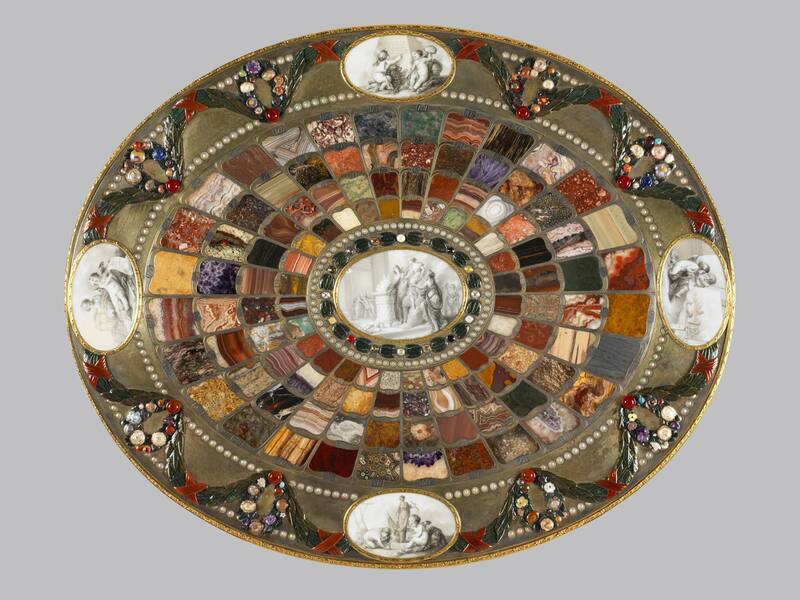 The oval top is inlaid with 128 specimens of precious stones and adorned with Saxon porcelain medallions depicting allegories of peace. The design of the table top, the composition of the table and the precious materials used, comparable to the most luxurious piece of jewelry, also uniquely illustrate the popularity of the natural sciences during the Age of Enlightenment: in a booklet placed in the table’s main drawer, each mineral embedded into the table top is numbered and identified. The table magnificently represents a secular tradition of precious metalwork in furniture attesting to the glory of the monarchs of Europe. Since it was received by the diplomat in 1780, the Table of Teschen has never left the Breteuil family. It represents both a masterful work by Johann Christian Neuber and an essential piece of French and European history. It immortalizes the Treaty of Teschen, considered by many historians to be the first modern treaty in which two nations, France and Russia, act as the guarantors of peace between Prussia and Austria. In the Table of Teschen, the Louvre has acquired for its collections a masterpiece carrying extraordinary symbolic, artistic and historical value. AXA’s philanthropy has therefore helped to safeguard a unique work and enrich the country’s national collections, while supporting the Group’s commitment to preserving and sharing cultural heritage.